As the name suggests, this route is a casual, relaxed experience. Like a fine wine, it is meant to be enjoyed at leisure and taken in stride. 20 venues along the banks of the picturesque Vaal River are selected each year to showcase South Africa's most elegant wines, over a designated period of time. The route can be travelled by car, taxi or river cruiser. Game drives at the neighbouring reserves, golf on the nearby courses or a visit to the Emerald Casino (which has an indoor water world, bowling and miniature golf facilities) are optional side meanders for an enjoyable family outing. 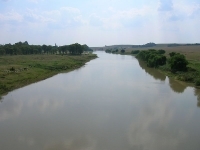 The Vaal is South Africa's second longest river and the Upper Vaal is the main recreational hub, centred on the towns of Vereeniging and Vanderbijlpark where guesthouses and lodges line the riverfront and various watersports are popular. Power-boating, jet-skiing, canoeing, fishing and even white water rafting are enjoyed on the river, making it a fun excursion from Johannesburg even when the wine route is not active. The wine route gives the area a festive atmosphere and the event is eagerly awaited by locals. Check out the official website listed below for details on the venues and wine.